18274 - When you use the MEMCACHE or MEMLIB system options the following error message occurs "Error: Cannot adjust the token privileges with error 1300." Usage Note 18274: When you use the MEMCACHE or MEMLIB system options the following error message occurs "Error: Cannot adjust the token privileges with error 1300." Error: Cannot adjust the token privileges with error 1300. User probably does not have the right to lock pages in memory. Select Start ► Settings ► Control Panel ► Administrative Tools ►Local Security Policy. For Windows 7 you can type Local Security Policy on the search box after you click the Start button for the Start menu. Expand Local Policies and click User Rights Assignment. Double-click Lock pages in memory. Determine if the user is listed in the Local Security Tab window. Instead of using the Control Panel, you can also type secpol.msc from RUN or a command line to open Local Security Policy. If the user is not listed, add the user name that was running SAS when you received the lock error message and restart SAS. For Windows 7, Vista and 2008 Server User Account Control (UAC) may still block locking pages in memory. Bypass UAC for a SAS session by right clicking the shortcut that starts SAS and selecting "run as administrator." Click the Start button for the Start menu. Type UAC to bring up the User Account Control Snapin and press ENTER. Drag the slider all the way to the bottom to Never notify. 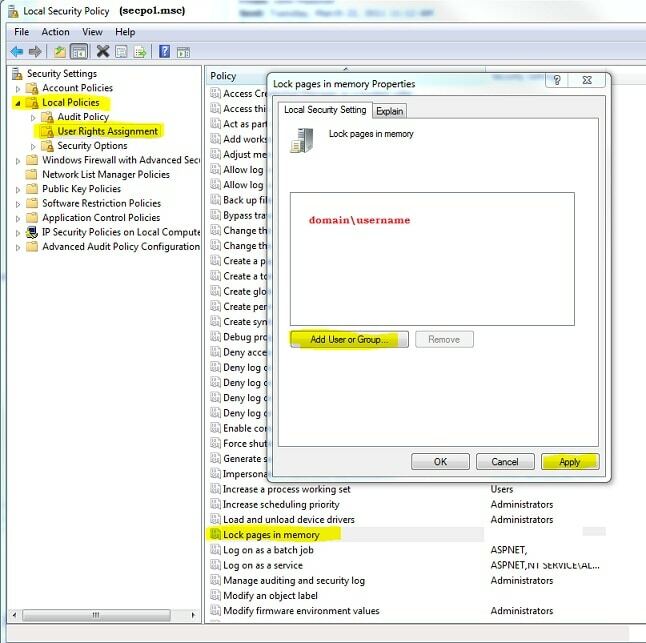 In order to use the SAS options MEMCACHE or MEMLIB you need to add your username to the Windows Local Security Policy "Lock pages in memory". For Windows 7 and Windows 2008 you may also need to turn off User Account Control.